Thank you so much Mehul. Glad you like it. Hello my sweet friend Jen. Thank you so much for taking the time to comment my dear friend. Love this one sweety, its looks so wonderful and fragile...the blurr is fantastic, giving it more depth! Have a great evening, be well! Really nice focus, light, details,tones, and dof .... nicely and uniquely done my dear ! Thank you so much dear Paolo. So glad you like it. Thank you so much for your comment my friend. Thank you so much dear Stan. Thank you for your comment dear Harry. so delicate flowers abd delicate colors i love it! daisys have a story but i cannot remember now:( will tell soon as i remember!! The photo-course is working I see. Funny, I had expected the fron to be focussed and the b/g to be blurred. Toning is nice. Thank you so much Joao. I appreciate your comment. Thank you Ananda. Glad you like it! Preparing another flower crown dear Julie ? Do you know if our nice and handsome model is again available? With respect to these flowers: Nearly floating in the dark with this black background, superb. Great work Julie, nice tones and beautiful highlighting of the flowers against the black background. This is amazing Julie. Even better than your previous flower shot. Excellent DOF selection. Thank you so much Avi! yes, soft focus and post processing is really great Julie ! good going !! Much more beautiful than colored one ! Thank you dear Heloiza. Glad you like it! So glad you like it GG. 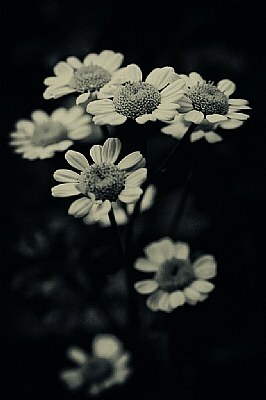 I have been working on a black and white floral project and this one so far is my favorite. Thank you so much for your comment. Big hug and kiss from sunny NY. Thank you so much cousie. You being proud of me means a lot! Great beauty and elegance in this shot, the quality, the focus and the composition are stunning Julie! !I have to agree with Deb..from the flower shots your BEST until know!!! !Amazing macro shot with wonderful subject details against the dark background! Hugs to you my dear from sunny Luxembourg ! great clarity and very good way that the flowers popped out from the blur dark background to the frond lighted and sharp area, I always love that in macro Julie! perfect! One of your best till date.... great going! !